You’re subscribed to RSS feeds, Twitter streams, email newsletters, and blogs. In short, you’re subscribed to so much online content that you’ve taken to ignoring it. Even hiding from it. You need a filter for your filter, but you’re too tired to set one up. I’ve stumbled across one that does at least part of the job, and does is so well that I’m addicted. It’s called paper.li. Sign-up took about a minute. I gave paper.li access to my Twitter account and it turned my Twitter feed (where I control subscriptions) into a beautiful newspaper. Now I see not an endless stream of Tweets but a “front page” index of Tweets (ones that have links), turned into teasers and links with photos. News is conveniently divided into sections (Technology, Politics). Modify the content stream (which begins with you and those you follow) to add users, lists, hash tags, keywords on Twitter and keywords on Facebook. Changes will appear in the next edition of your paper. Paper.li is not perfect, but now, instead of ignoring everything, I’m seeing some great stuff in my paper. 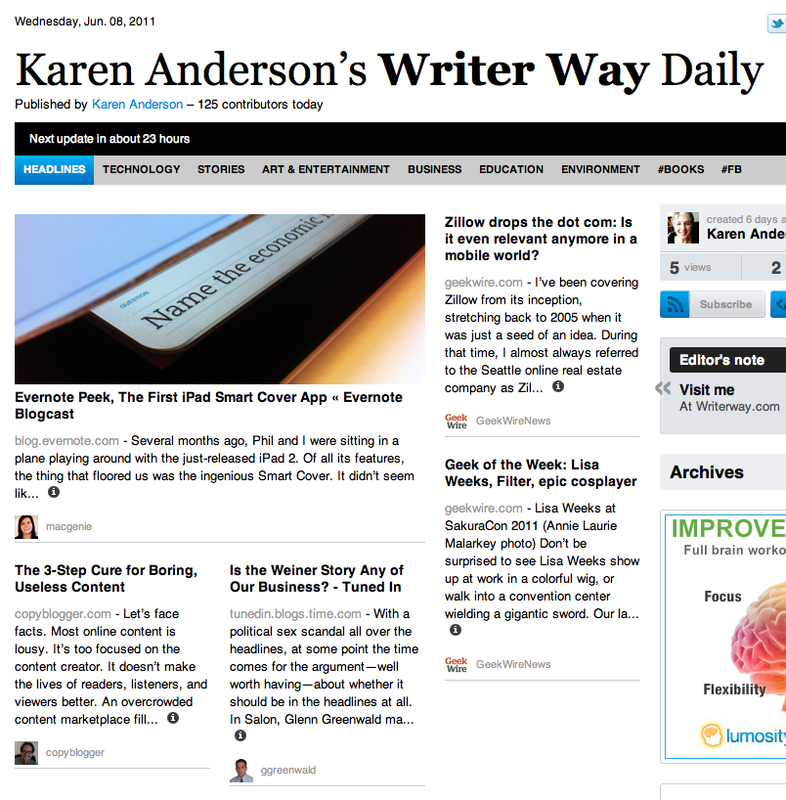 At least two or three of the stories inspire me to blog, so I’ll be doing more with WriterWay. It’s really cool what it’s done to my Twitter feed, and I totally don’t understand how this works or what it’s doing. I post to Twitter but never look at what’s on it, so maybe it will help deal with the low signal to noise ratio issue of that platform. Glad you like it! I’m hoping fervently that the folks at paper.li with incorporate more features, such as the ability to have a few different papers emerge from one Twitter stream, to have one’s Linkedin status updates added. Let’s hope.